What is all of this buzz about rain gardens? Rain gardens have the potential to solve stormwater runoff problems before they occur. And, rain gardens add a low maintenance, landscaped feature in your yard! A suitable area located between the rainwater source and its destination that is at least 10 feet from a home or building and is either a depressed area or an area where water flows naturally. a dense-material mulch that won’t float away. Earth-moving tools (to excavate about 6-9" of soil) and planting tools. A desire and willingness to manage stormwater on-site and protect water quality. View a sample budget for rain garden materials. More elaborate designs may include the addition of underground corrugated pipes to convey rooftop runoff from downspouts to the rain garden location or perhaps the addition of a rain barrel. View a plant pallette (587KB, pdf) that may be suitable for your South Carolina rain garden. 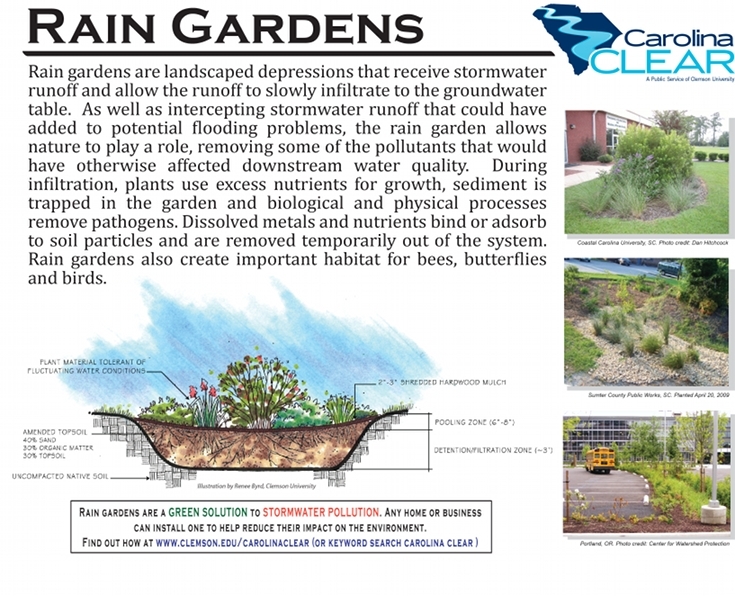 Carolina Clear has a new rain garden manual for 2016. You can download here or see the Clemson Marketplace to order a printed copy.